So I’ve had a very busy week, and with the internet playing up I haven’t had the chance to blog about 8th Hornchurch Scotus and Leagrave Scouts. The two groups have had a very busy weeks. 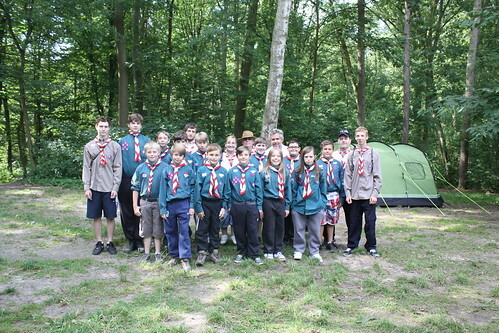 Both groups spent their first day doing the typical visit to the Scout museum, (I think I’ll be a local by the end of the season) and then a wander around Leuven which was having another festival, this time, rock music. The town centre was packed full of stands and stalls giving away freebies – we now have 30 beach balls floating around the camp! Hornchurch rounded off the day bowling before heading back to camp. Leagrave headed back for an early dinner and campfire. Walibi Theme Park was the fist day trip for Leagrave scouts, who had much better weather than poor old Shogun and Legend. On Tuesday Leagrave set off for the hike and canoe with a few of the Scouts staying back for a spot of cycling. Wednesday morning the group helped out on the campsite with some digging around and general clearing up, the afternoon was spent having a well deserved rest! Oceade water park was next on the agenda, four hours in a swimming pool and they all came out looking like prunes. The final day was spent at Hungaria Climbing centre in Leuven. 20 odd scouts trying to squeeze through tiny holes in the pitch black creates a hell of a lot of noise! Climbing was just the same with screams from most of the girls. Well done Sky and Cameron, two of the smallest scouts who got to the top of the hardest wall. Hornchurch went back to basic with some bushcraft skills on Monday. The Scouts carved wooden spoons, and attempted a pioneering project. An evening was also set aside for some backwards cooking of beef stew in tin foil bags and cake made on the fire. The Hornchurch boys also tried their hand at the canoeing, which resulted in a number of the scouts going for a swim. Bruges was a big day out for the Hornchurch Scouts who took the hour and half journey to visit the City dubbed as the ‘Little Venice’ where they went on a canal boat tour and had dinner at a Chinese restaurant. Tomorrow two new groups arrive, Hornchurch and Leagrave will take their coach home and the excitement and activities will begin again.